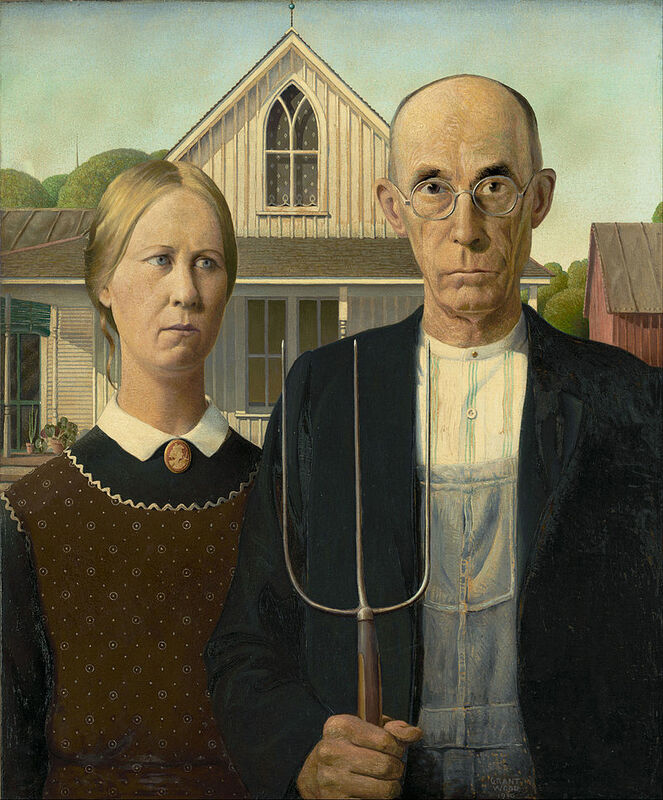 Grant Wood's American Gothic—the double portrait of a pitchfork-wielding farmer and a woman commonly presumed to be his wife—is perhaps the most recognizable painting in 20th century American art, an indelible icon of Americana, and certainly Wood's most famous art work. But Wood's career consists of far more than one single painting. 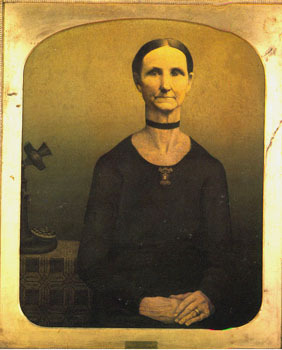 Grant Wood: American Gothic and Other Fables brings together the full range of his art, from his early Arts and Crafts decorative objects and Impressionist oils through his mature paintings, murals, and book illustrations. 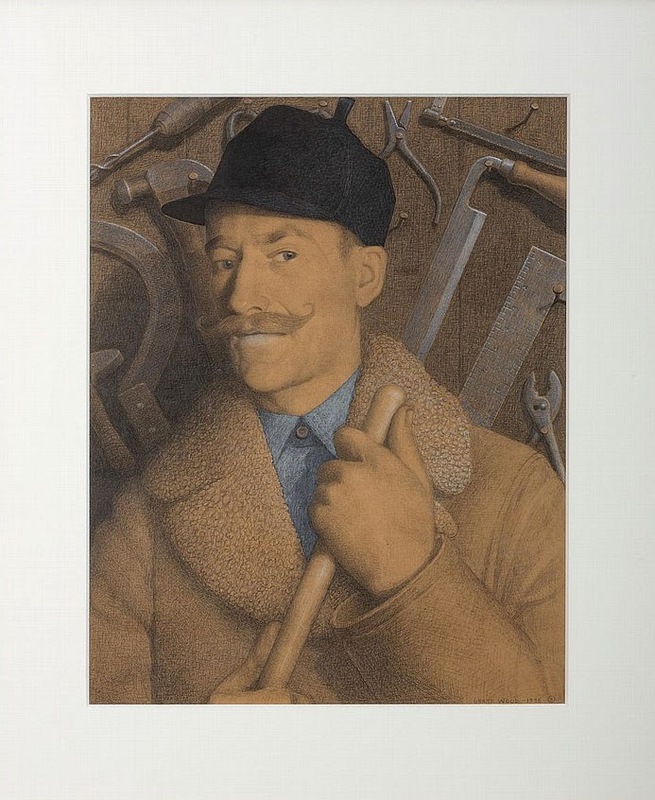 What the exhibition reveals is a complex, sophisticated artist whose image as a farmer-painter was as mythical as the fables he depicted in his art. Wood sought pictorially to fashion a world of harmony and prosperity that would answer America's need for reassurance at a time of economic and social upheaval occasioned by the Depression. Yet underneath its bucolic exterior, his art reflects the anxiety of being an artist and a closeted gay man in the Midwest in the 1930s. By depicting his subconscious anxieties through populist images of rural America, Wood crafted images that speak both to American identity and to the estrangement and isolation of modern life. 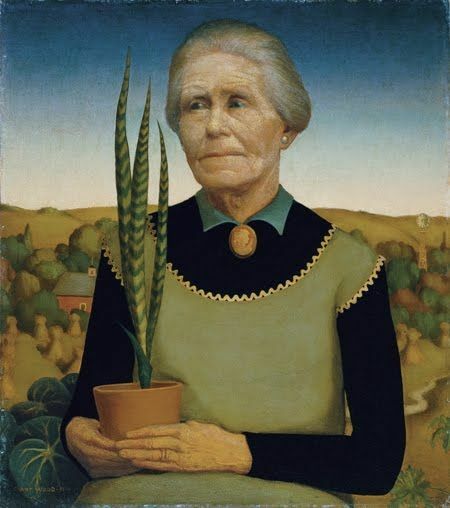 Grant Wood (1891–1942) became an overnight celebrity following the debut of American Gothic, his now-iconic portrait of a Midwestern farm couple, at the Art Institute of Chicago in 1930. Only a year earlier, he had been a relatively unknown painter of French Impressionist–inspired landscapes in Cedar Rapids, Iowa. His short mature career, from 1930 to 1942, spanned some of the most trying, soul-searching years for the United States, as the country grappled with the aftermath of an economic meltdown and engaged in vigorous, sometimes bitter debates over its core national identity. What emerged as a powerful strain in art and popular culture during this period was a pronounced reverence for the values of community, hard work, and self-reliance that were seen as fundamental to the national character and embodied most fully by America’s small towns and farms. Wood’s farmscapes and portraits epitomized these sentiments. 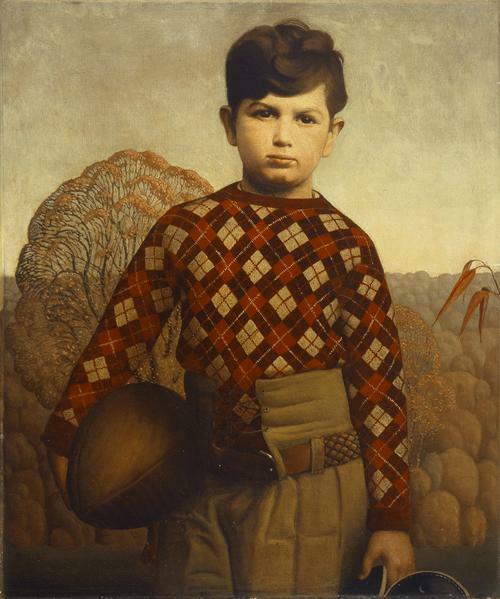 His romanticized depictions of a seemingly more innocent time elevated him into a popular, almost mythic national figure, celebrated for his art and his promotion of Regionalism, the representational style associated with the Midwest that dominated American art during the Depression. Today, it is clear that the enduring power of Wood’s art owes as much to its mesmerizing psychological ambiguity as to its archetypal Midwestern imagery. An eerie silence and disquiet run throughout his work, complicating its bucolic, elegiac appearance. The tension between his desire to recapture the dreamworld of his childhood and his instincts as a shy, sexually repressed Midwesterner seeped into his art, endowing it with an unsettling solitude and chilling sense of make-believe. Wood’s conflicted relationship with the homeland he professed to adore may be a truer expression of the unresolved tensions in the American experience than he might ever have imagined, more than seventy-five years after his death. 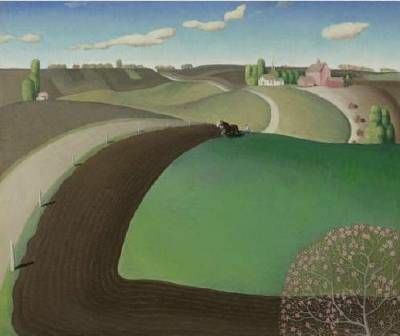 Wood’s landscapes do not depict Midwestern farm life in the 1930s. Instead, they portray his idealized memories of the 1890s farm in Anamosa, Iowa, where he lived as a young boy before moving to Cedar Rapids with his family following the death of his father. His desire was not so much to portray a world that was becoming extinct as to recover a mythical childhood that existed only in his imagination. Wood began his career as a decorative artist. Even after he shifted to fine arts, he retained the ideology and pictorial vocabulary of Arts and Crafts, a movement that promoted simplicity of design and truth to materials. To it, he owed his later use of flat, decorative patterns and sinuous, intertwined organic forms as well as his belief that art was a democratic enterprise that must be accessible to the average person, not just the elite.Wood’s training began early. For two summers after graduating from high school he studied at the Handicraft Guild in Minneapolis before joining the Kalo Arts and Crafts Community, a workshop and training facility for artisans in Park Ridge, Illinois, a suburb of Chicago. In 1914, he opened the Volund Crafts Shop with a fellow craftsman and began to receive recognition for his jewelry and metalwork in the Art Institute of Chicago’s prestigious annual decorative arts exhibitions. Nevertheless, commercial success eluded him and he closed the shop and returned to Cedar Rapids in 1916to begin his painting career. The decision did not, however, bring an end to his work in decorative arts, which he continued well into the 1930s. Overmantel Painting and the corncob chandelier on view in this gallery are from design commissions for a home and a hotel dining room, respectively. By the late 1920s, Wood had come to believe that the emergence of a rich American culture depended on artists breaking free of European influence and expressing the specific character of their own regions. For him, it was Iowa, whose rolling hills and harvested cornfields served as the background for his earliest mature portraits, those of his mother and Arnold Pyle, on view in this gallery. In Europe, he had admired Northern Renaissance painting by artists such as Hans Memling and Albrecht Dürer. 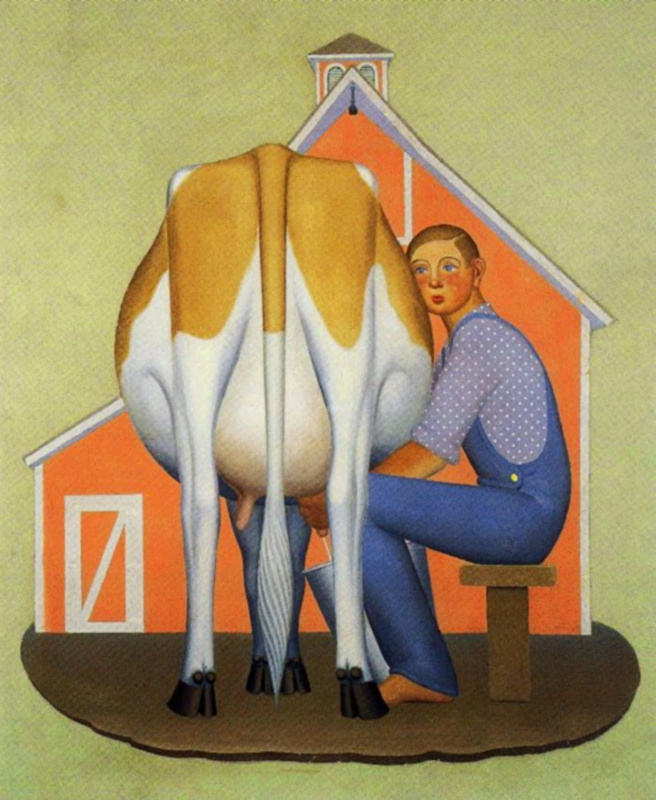 By the time he painted American Gothic in 1930, he had concluded that the hard-edge precision and meticulous detail in their art could be used to convey a distinctly American quality, especially suggestive of the Midwest. Joined with Iowan subject matter, it became the basis of his signature style. Wood felt that all painting, portraiture included, must suggest a narrative in order to engender the emotional and psychological engagement he associated with successful literature. Consequently, he included images that hinted at the life and character of the depicted subject, taking care to avoid anecdotal illustration by painting archetypes rather than individuals. He left the “props” in his portraits intentionally ambiguous, making the stories they intimate so enigmatic that they defy ready explanation; they are puzzles to be deciphered by viewers based on their individual attitudes and experiences. As a result, Wood’s portraits have historically invited multiple interpretations. Wood created his first mural in his mature, hard-edge style in 1932to decorate the coffee shop of the Hotel Montrose in Cedar Rapids. Called Fruits of Iowa, the mural consisted of seven panels, three of which are on view in this gallery, depicting a farm, a fruit basket, and members of a plump, ruddy-cheeked farm family. His concurrent appointment as state director of the PWAP for Iowa limited his role to designing two murals for the university and supervising their execution by other artists. The first mural to be completed, devoted to agriculture, engineering, and homemaking, was installed at the top of the stairwell leading into the library in 1934; the second mural, showing a pioneer farmer plowing a field, was installed in the library’s lobby in 1937. Both murals can be seen in the film projected in this gallery.Wood’s experience as a decorative artist led him to view fine and applied art as being equal. In addition to designing textiles, an armchair and accompanying ottoman, and a Steuben glass vase, he illustrated two books and made cover images for eight others. The first book he illustrated was the 1935children’s book Farm on the Hill, written by Madeline Darrough Horn. In 1936, he illustrated a deluxe publication of Sinclair Lewis’s novel Main Street(1920). As he often did with his paintings, he asked friends to pose for the illustrations, dressing them in costume for the occasion. Wood’s desire to reach a broad audience with his art likewise led him to make lithographs through the Associated American Artists (AAA), which published and sold prints by major American artists in department stores and by direct mail for five dollars apiece. 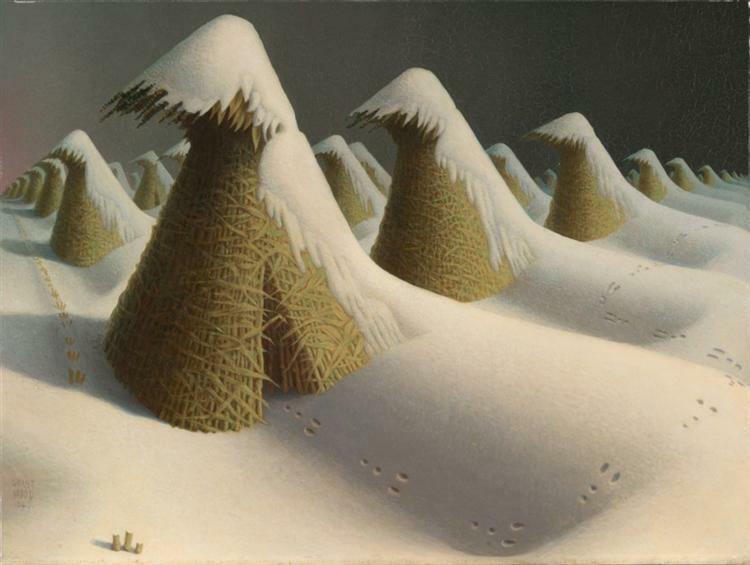 Making affordable art appealed to Wood, who completed eighteen lithographs for the AAA between 1937and 1941. Wood’s working process was methodical: He made full-scale drawings of each of his landscape paintings before beginning them in oil, building up the drawing’s forms by layering multiple small strokes one on top of the other. In some cases, the drawing preceded the oil by several years. 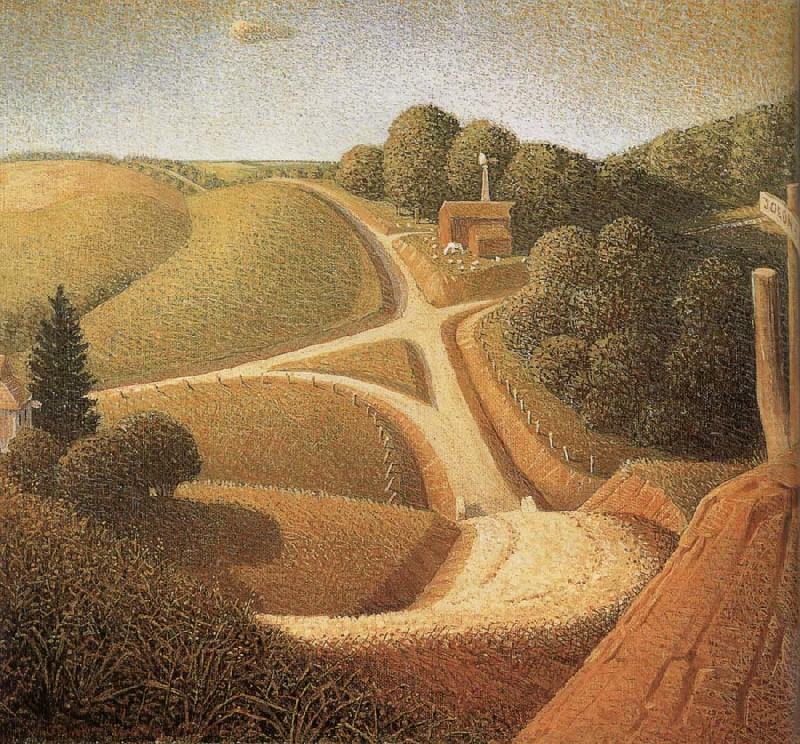 Wood’s landscapes do not depict Midwestern farm life in the 1930s. Instead, they portray his idealized memories of the 1890s farm in Anamosa, Iowa, where he lived as a young boy before moving to Cedar Rapids with his family following the death of his father. His desire was not so much to portray a world that was becoming extinct as to recover a mythical childhood that existed only in his imagination. 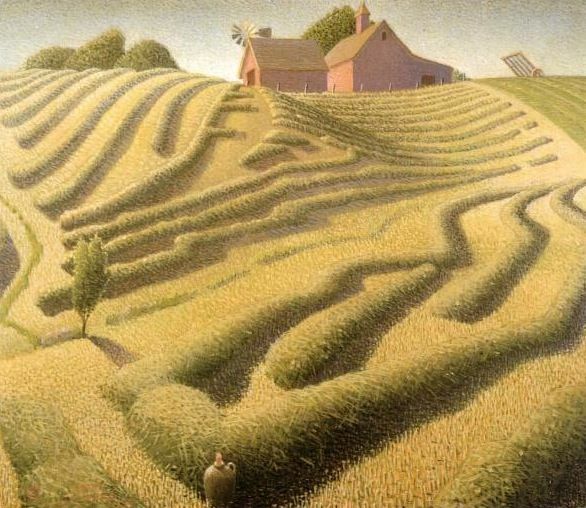 In his early landscapes, on view in the previous gallery, Wood had recast the farmscape of his childhood into an Arcadian fantasy of undulating, swollen shapes and decorative embellishments whose multiple focal points keep the viewer’s eye in constant motion by giving all parts of the composition equal weight. 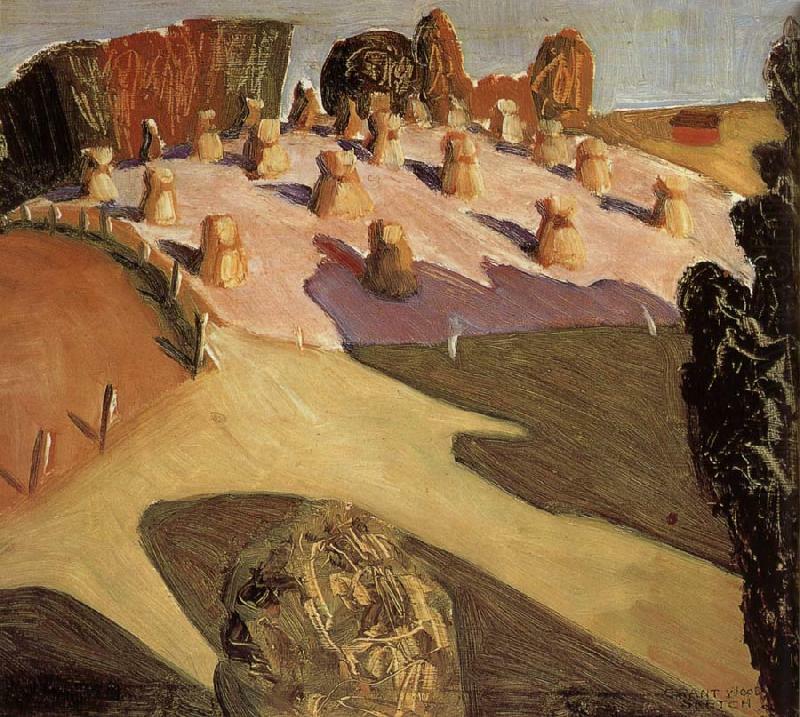 By 1935, he had begun to streamline his landscape style, replacing the ornamental frills and mannerism of his earlier work with broad, reductive shapes. He retained this stylistic simplification as he shifted to more patriotic subject matter in response to worries that America had lost its will to defend itself against fascism, which was on the rise in Europe. 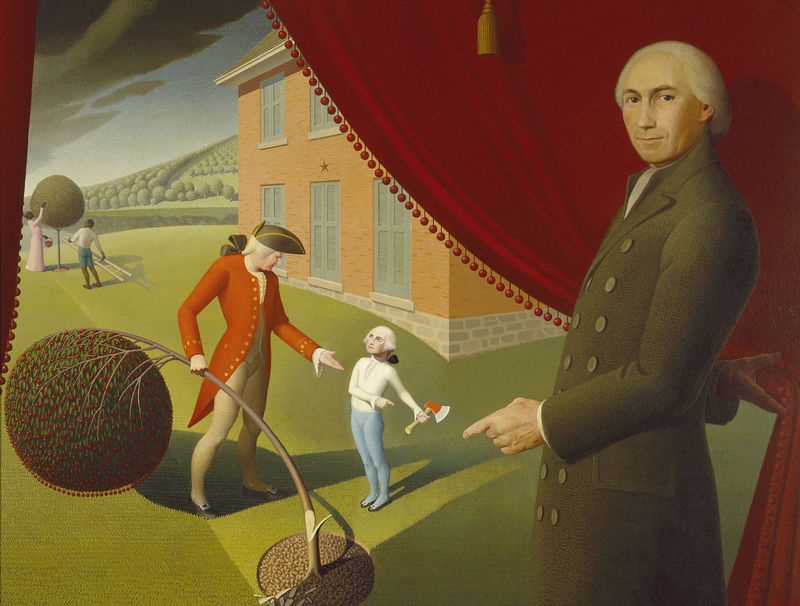 He envisioned a series of paintings of American folktales, beginning with Parson Weems’s fictional account of George Washington as a child confessing to having chopped down his father’s cherry tree. Faced with Nazi victories over the Allies in the first years of World War II, Wood turned his attention to depicting what he called the “simple, everyday things that make life significant to the average person” in order to awaken the country to what it stood to lose. He completed only two works in this second series—Spring in the Country and Spring in Town—before his death from pancreatic cancer on February 2, 1942, two hours before he would have turned fifty-one. Grant Wood: American Gothic and Other Fables is organized by Barbara Haskell, Curator, with Sarah Humphreville, Senior Curatorial Assistant. Art, Iowa City; gift of Mel R.
Coe College, Cedar Rapids, Iowa; gift of the Eugene C.
Fine Arts Museums of San Francisco; gift of Mr. and Mrs.
National Gallery of Art, Washington, DC; gift of Mr. and Mrs.